"If I won the lottery, I would buy a big chunk of land with lots of water so I could fish." 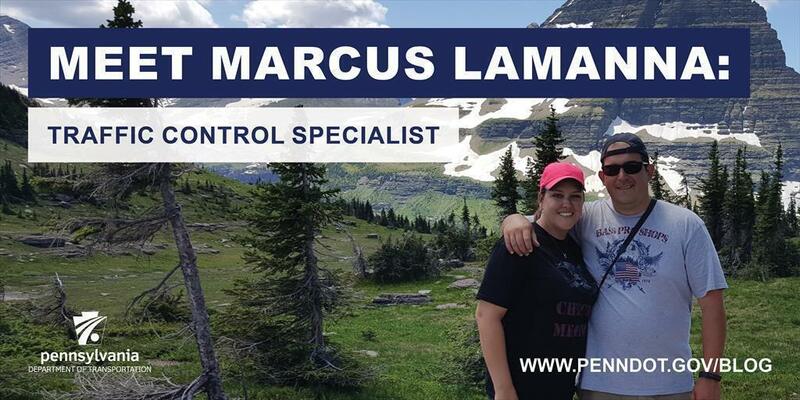 Marcus LaManna, a traffic control specialist in the Harrisburg-based District 8 Eastern Regional Traffic Management Center loves the outdoors. He continued to say that he'd buy land in Georgia, Missouri, or Louisiana. He and his family would travel to Alaska, Japan, and Hawaii. But LaManna's fortune would be PennDOT's loss, as his knowledge and support of traffic safety are invaluable assets to the department. Despite his love for the outdoors, LaManna spends most of his day indoors in front of a bank of computer screens watching traffic cameras from around the region. PennDOT's traffic management centers oversee 24/7 operations of the freeway and major arterial systems through the use of ITS devices, freeway service patrols, communication with emergency responder agencies, and close coordination with districts and other agencies. LaManna also is part of the District Incident Response Team (DIRT), which helps to manage traffic issues when there are major incidents. He is often "the boots on the ground" facilitating incident management and coordinating our partners to ensure a speedy and safe cleanup. LaManna and the Eastern Regional Traffic Management Center crew also have been responsible for reviving the Traffic Incident Management (TIM) teams, which review best practices in terms of incident management, and how to quickly and safely clear interstates to get traffic flowing again. The last time one met in District 8 was after the infamous Valentine's Day storm in 2007. If LaManna had his way, he'd be outdoors all day. He and his family love to travel to national parks and are trying to fill a national park "passport" by visiting every park in the United States. They have hit many, including Yellowstone, the Grand Tetons, Glacier (his favorite) and Shenandoah. Just recently, LaManna and his family (wife Heather and sons, Justin and Michael) spent a few weeks in Utah and Montana, visiting Zion, Bryce, and the Grand Canyon. Aside from enjoying nature outdoors, LaManna gets outside by playing on the PennDOT District 8 softball team, the Highway Hackers. He plays first base, third base, or outfield. The team plays other state agencies, legislators, and credit unions.